1. The augmented reality approach leads to an amplified focus on Self. Humans are narcissistic beings. Research has shown that we pay more attention to things that relate to ourselves, and that when we talk about ourselves, the dopamine reward circuit in our brains is activated, which is why it feels good. So, by giving the player complete control, you make the game about them. You might have control of your player or character when you play other games such as Call of Duty, but the augmented reality of Pokémon Go gives you the ability to self-generate the experience literally whenever and wherever you wish, provided you have your phone on hand. You can catch Pokemon in the park, in the office, or in your apartment, day or night. You get a little boost in self-efficacy every time you open the game and something happens, because you recognize that you govern this virtual layer on top of your existing environment. This achievement is reflected in both self-image and product appreciation, which keeps you coming back for more. 2. The game is one continuous novel playscape. 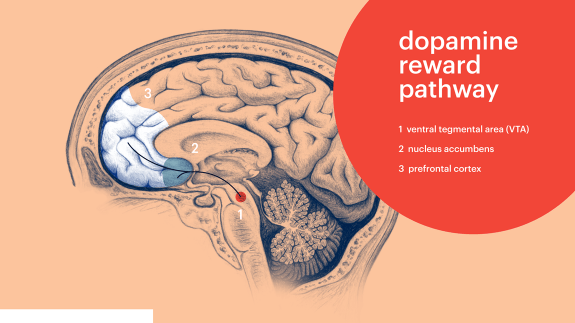 Our brains love novelty, and the same dopaminergic reward pathway that’s accessed when we talk about ourselves is also activated when we experience new things. Activation of this pathway directs individuals to repeat what they just did to get more rewards. In the case of Pokémon Go, you’re experiencing new things every single time you play the game — and that drives you to go to new locations, so you can find new Pokemon. 3. The emotional impact is layered. Research has shown that virtual responses activate the same neural networks as real experiences, in the same way that images of rewards and real rewards are perceived almost identically in the brain. Pokémon Go takes cues from the actual environment and couples them with the virtual world for greater impact. For example, if you’re near a body of water you might catch a Magikarp, and if you’re in the subway you might catch a Rattata — this water/land congruence increases your sense of delight and accomplishment. Bundling emotions strengthens the positive association with the game and keeps you hooked. 4. The game promotes social connection. Social needs are some of the most powerful drivers of behavior. We are influenced by what others around us do, so if everyone is playing Pokémon Go, we’ll be encouraged to do the same. Currently more than 90% of Americans ages 18-65 have heard of Pokémon Go. The mobility of the game as a result of augmented reality also allows for collaboration among players locally and virtually. If the guy you see pacing around the corner is catching Pokemon, then there’s an instant connection there, a recognition that you’re part of something bigger — not only through conversation, but through in-game collaboration and competition. The big takeaway? Pokémon Go employs techniques commonly used in video game design, but the augmented reality approach has enhanced and magnified these effects to capture and distract us on a whole new plane. Amanda Phingbodhipakkiya is an art director at Primacy and founder of The Leading Strand, an initiative that shines a light on scientific research through design. She was part of the first-ever TED Residency and holds an MFA from Pratt and a neuroscience degree from Columbia. How this science works in pokemon go? This is really awesome game. Literally everybody is crazy behind this. i just love this. it is my favorite game. Have you guys checked pikapatrol.com? I heard they made it look easy to catch Pokemons.